IKEDA Sound Labs new KAI Reference MC Cartridge is the highlight of over four decades of experiences in cartridge design. The KAI is designed to rank amongst the very best out there together with Lyra Atlas and Goldfinger Statement. It represents Ikeda san's over 4 decades of experiences in cartridge design. The KAI represents his finest masterpiece ever made in his entire analog career. The new KAI moving coil cartridge is the culmination of technology and craftsmanship to now represent his best efforts to date. The special IKEDA Blue Alumite housing is crafted from solid Aluminum alloy with buff finish. The Top of the cartridge is made of Titanium. The Base of the cartridge to sustain the generator unit is made of Titanium. The Cantilever is made of Boron to ensure proper delivery of oscillation. Highly efficient Permalloy core, low impedance coils, ideally shaped magnet yoke and the generator unit embedded a samarium-cobalt magnet are further highlights of the new IKEDA KAI MC Cartridge design. Each cartridge is hand assembled, precisely aligned and inspected one by one. Output voltage is 0.19 mVrms, coil impedance is 2.5 Ohms and appropriate stylus force is 1.8 gram (+/-0.2 grams). Frequency response is from 10Hz to 45kHz, channel separation is over 27dB and channel balance is within 1.0dB (1kHz). The newest flagship Ikeda KAI MC cartridge is the very special model that uses the high quality materials and components in each part of cartridge in order to further improve the performance over conventional models. The body unit is made of a solid aluminum alloy and the base mounting the generator unit is made of the strongest Titanium by lathing a piece of aluminum alloy and Titanium one by one precisely. The body unit is buff polished and then coated with an Ikeda Blue Alumite. These special materials and the craftsmanship will bring out thoroughly the possible abilities of both the micro-ridge stylus chip which will be able to trace a groove accurately up to the super high range and also of the cantilever made of Boron which can secure a superior delivery of oscillation. In addition, thanks to the highly efficient Permalloy core, low impedance coils, ideally shaped magnet yoke and the generator unit embedded samarium-cobalt magnet; it is possible to reproduce the sound as close as the original at the highest level. 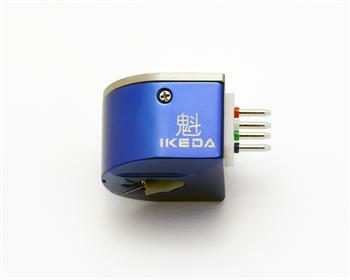 Ikeda KAI cartridge is always sophisticatedly assembled, precisely aligned and inspectingly produced one by one by spending plenty of time with the fulfillment of various kinds of conditions required for the best phono cartridge as a playback device, for instance, in order to extract the musical elements as it is recorded in LPs/SPs, especially the outperformance hidden in the specifications.